The true standout of the night was the fried chicken. Were I to have closed my eyes and taken a bite, I would not have been able to discern breast from thigh. Even with my eyes open, I did a once-over to make sure I was in fact eating a piece of breast meat. It was as succulent, juicy and tender as a piece of thigh meat, but sans the high oil content. The peas and carrots were cooked fresh, as the peas possessed an unusual “pop” to them when I bit into each sphere. The buttermilk biscuit was flaky but not at all greasy — a rare combination. Did I mention that I wasn’t even the one who ordered the chicken? The maple-glazed pork chop that I got was nicely paired with bacon-laced farro, braised escarole (to offset the sweetness of the maple) and a grain mustard sauce. Nonetheless, the pork chop was slightly overcooked, and I was far too enraptured by the chicken to give anything else attention. Still, I was impressed when, at the end of the meal, a busboy brought out my leftovers in a small box that had been dated and labeled “Firefly Pork Chop.” The staff had struck a balance between casual professionalism, culinary knowledge, friendliness and cooking skill. That, to me, made it the epitome of an exceptional neighborhood restaurant. I left the restaurant a little heavier in the stomach, but a little lighter on my feet. What do you think is the mark of a great neighborhood restaurant? This entry was posted on October 28, 2007 at 6:04 am and is filed under Restaurants, Reviews with tags fried chicken, questions. You can follow any responses to this entry through the RSS 2.0 feed. You can leave a response, or trackback from your own site. The mark of a great neighborhood restaurant is a general sense of warmth…one where both local residents those coming from farther away are treated with the same geniality. Where your service seems to care about making a personal connection with the customers – whether if that is by the chit-chat or if they go the extra mile to help you find out what made that fried chicken so damn good. 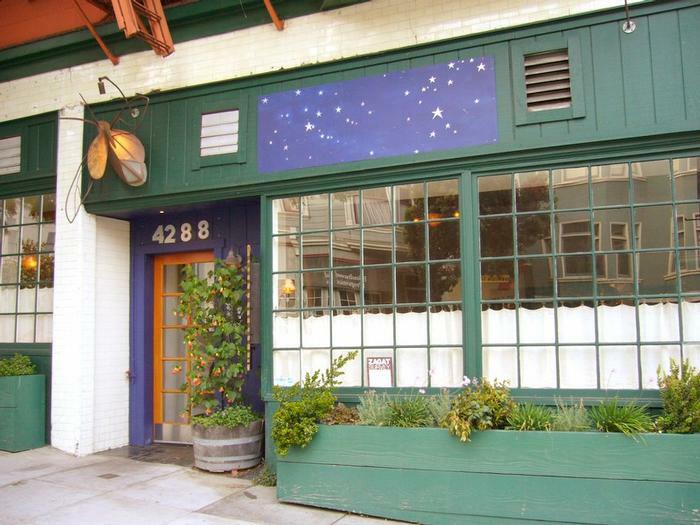 I felt all those things at Firefly, and that’s why it is one of my favorite SF restaurants! My baseline is still Popeye’s Fried Chicken. And from what I know, the fried chicken at Firefly’s did not disappoint. My only gripe is the fact that the entree did not come with hot sauce – the proper way to eat fried chicken. You know, I have to agree. And everybody knows that my baseline for hot sauce is the Tabasco green kind. However…the house made red sauce at Maverick did not disappoint, either!